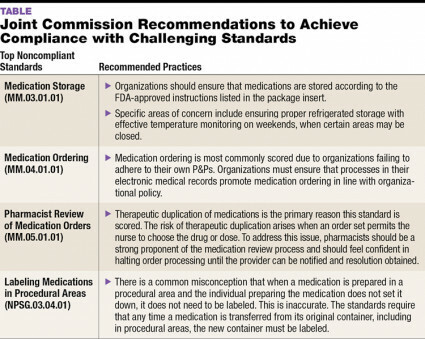 The Joint Commission’s Medication Management (MM) standards and National Patient Safety Goals (NPSGs) are designed to inform an accredited organization’s policies and procedures (P&Ps) to improve patient care and enhance safety. A clear understanding of these standards, as well as keeping abreast of changes and updates, are essential to properly caring for patients and ensuring compliance. In 2018, The Joint Commission enhanced its process for evaluating sterile compounding. Surveys of accredited organizations have prompted several key observations, including identifying the areas that have experienced significant practice improvement as well as those areas that are marked by noncompliance. Several areas of noncompliance, as well as areas that have demonstrated improvement, have been noted by The Joint Commission in 2018 surveys. Noncompliance. 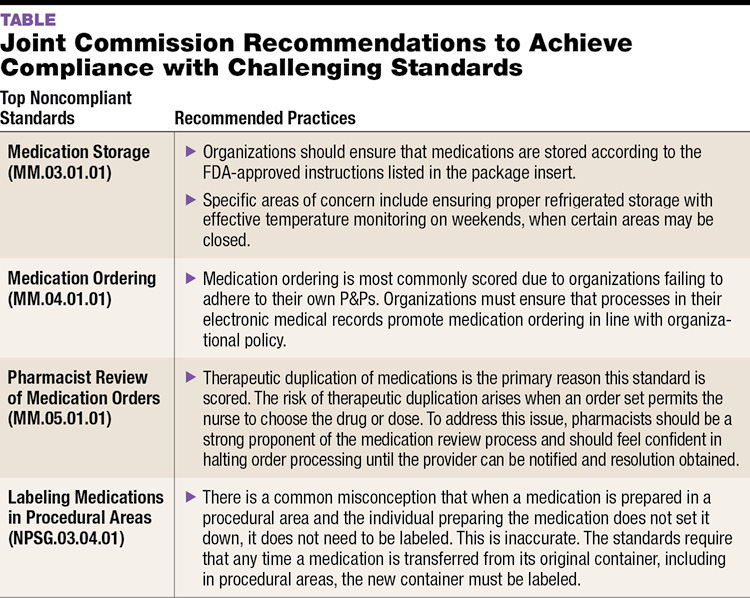 The top MM-related noncompliant standards for 2018 include proper medication storage (MM.03.01.01), following P&Ps related to medication ordering (MM.04.01.01), ensuring pharmacist review of medication orders (MM.05.01.01), and appropriately labeling medications in procedural areas (NPSG.03.04.01). The Joint Commission offers suggestions for how to achieve compliance in these areas (see the TABLE). Areas of Improvement. Continued improvement has been noted in medication security and the safe use of anticoagulant therapy. For example, organizations have made significant strides to understand the requirements of the standards as they relate to preventing unauthorized access to medications and have taken actions to secure medications appropriately. In addition, surveys have illustrated improvement in ensuring that anticoagulants are ordered and administered safely. The Joint Commission published new and revised pain management standards that went into effect in January 2018. The majority of these standards appear in the Leadership, Provision of Care, and Medical Staff chapters of the Hospital Accreditation Manual. The standards require that a Joint Commission-accredited hospital establish P&Ps that address comprehensive pain assessment and treatment. Pharmacy teams should familiarize themselves with these standards as they create a foundation for both pharmacological and non-pharmacological approaches to pain management. The pain management standards are available at: www.jointcommission.org/topics/pain_management.aspx. In addition, new requirements were released in January 2018 that address emergency power for critical refrigerators and automated dispensing cabinets (ADCs). Adherence to these standards is vital to ensuring that medication availability and storage are not affected during emergency situations wherein municipal power is compromised. The Joint Commission requires hospitals to implement a policy to provide emergency backup for ADCs, pharmacy carousels and robots, and essential refrigeration. More information about the emergency power requirements is available at: www.jcrinc.com/assets/1/14/ECN_21_2018_01.pdf. With the December 1, 2019 official implementation date of USP <800> rapidly approaching, The Joint Commission is currently evaluating the survey process through the lens of USP <800> principles to determine the impact the chapter will have on surveys. For early adopters that attain compliance with USP <800> prior to the enforcement date, The Joint Commission will not score noncompliance with those situations in which USP <800> and USP <797> conflict. The Joint Commission’s extranet site offers several downloadable resources for accredited organizations, including a leading practice library, which provides surveyor-identified best practices that have been submitted and reviewed by Joint Commission staff. In addition, accredited organizations may submit questions online to the Standards Interpretation Group to receive detailed interpretations of the standards requirements (questions can be submitted at: www.jointcommission.org/standards_information/jcfaq.aspx). Understanding the new and revised Joint Commission standards is critical to developing safe, compliant practices. Accredited organizations are advised to commit time and resources to keeping informed of compounding regulation changes, storing medications properly, adhering to medication ordering P&Ps, and ensuring medications in procedural areas are correctly labeled. Robert Campbell, PharmD, is the director of the Clinical Standards Interpretation Group for Hospital and Ambulatory Programs and director of medication management for The Joint Commission. He received his PharmD from Florida A&M University College of Pharmacy.